We discuss how crowdfunding might influence the future of scientific research in this episode of The Engineering Commons. Adam is willing to fork over a few dollars to further scientific studies of the universe; how about you? Crowdfunding is a means for raising money that has recently been garnering a lot of attention. 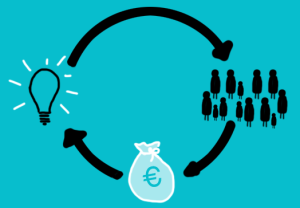 Websites that cover the crowdfunding phenomenon include Crowd Funding Eye and crowdsourcing.org. A few of the most popular crowdfunding platforms include Kickstarter, Indiegogo and RocketHub. Many other crowdfunding platforms also exist. The Pebble E-Paper Watch campaign raised more than $10 million on Kickstarter last year. Basic Research studies the nature of the universe, without seeking any particular commercial benefit. The bulk of basic research in the United States is funded by the federal government and universities. In contrast, Applied Research attempts to solve practical problems, and is most commonly supported by industrial interests. Projects the size of the cancelled Superconducting Super Collider are obviously too large to be crowdfunded at this point. Brian first became aware of scientific crowdfunding via the Weekly Weinersmith podcast. The #SciFund Challenge helps scientists prepare for crowdfunding, with the actual fundraising campaign being hosted on RocketHub. Jeff recently noticed a Kickstarter project where a Michigan State professor was looking to fund a self-paced course in analog electronics. In a recent interview, #SciFund Challenge founder Jai Ranganathan talked about how scientists are adapting to today’s funding environment. Brian notes an Indiegogo campaign that raised more than $700,000 to send a bus monitor on vacation. Jeff mentions the Folding@home project that networks together personal computers from all over the world to form a supercomputer capable of simulating protein folding. A space telescope, with the acronym of ARKYD, is being crowdfunded on Kickstarter with a funding goal of $1 million. In comparison, NASA’s James Webb Space Telescope has already spent more than $3 billion, with the project not yet completed. The plasma technology video that Jeff mentions is a spoof, making light of how scientists might have to go about getting funding in the future. Carmen mentions the YouTube channels of Veritasium and Minute Physics. The Mantis Shrimp seems to be getting more attention in the scientific community these days. The decision on how to allocate dollars to marketing is not an easy one for charities, and Jeff thinks that it will be no easier for scientists trying to raise funds from the general public. The fruit fly has four pairs of chromosomes, and is frequently used in genetics research. Brian notes that Local Motors is an organization that shares information about vehicle design. They are currently crowdsourcing the design of a motorized bike. Jeff has a crazy notion about engineering APIs; Carmen and Brian point out that such “tribal knowledge” already exists as app notes and online forums! I wish you would do more podcasts! I’m an engineering student @ OU and I tell fellow engineering student about your podcast all the time. Look forward to each one. Thanks, Morgan! Glad you enjoy the podcast. It would be nice to publish episodes more frequently, but it takes a bit of time to research material, schedule guests, and prepare show notes. Nonetheless, I’ll give some thought to how we might push out content a bit more often.